I know its been literally years since my last post, but I've been still baking and making up a storm despite not blogging about it. Not sure about you, but between the baking, picture taking, blogging and consuming all of these wonderful calories it can get pretty intense. So I've decided that while I'm not going to commit to blogging regularly, I will commit to making any of my posts much more minimal effort on my part and also on yours. Only recipes that I'd make again, less commentary to read (just get to the good stuff) and likely nothing fancier than iPhone photos. So what recipe has dragged me out of my blogging slumber do you ask? This... It also helps that I bought my husband the ice cream maker attachment for our lovely Kitchenaid mixer. It sounds like this recipe may be an adapted version by Saveur using a Jeni's Splendid ice cream base. Aside from the painful wait of letting this set up in the freezer, the recipe wasn't too complicated and it was relatively easy to follow. I also liked that it didn't have raw eggs in it, which just weirds me out. BLACKSTRAP MOLASSES + PECAN PRALINE ICE CREAM!!!!! YASSS!!! Recipe found on Saveur. Makes about one quart. 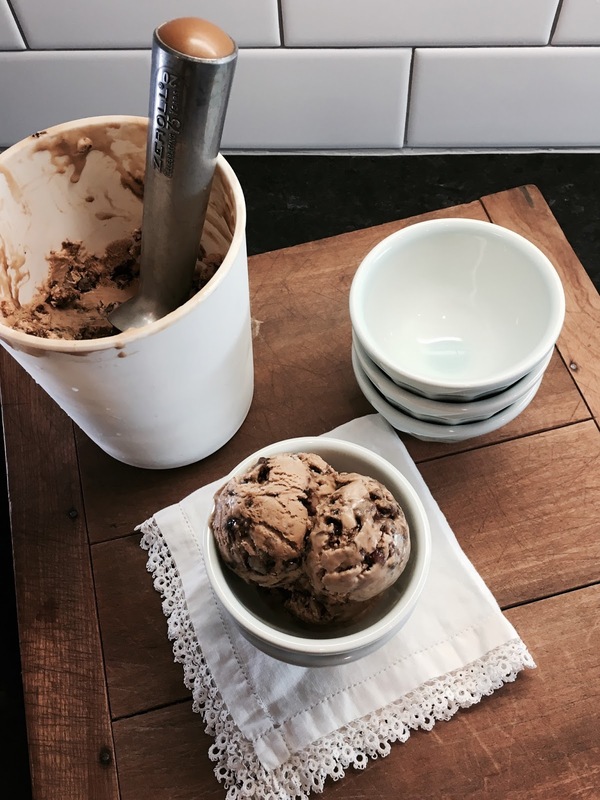 Make the ice cream: In a bowl, stir together 1⁄4 cup milk and the cornstarch; set aside. In a 4-qt. saucepan, whisk together remaining milk and the cream, sugar, molasses, and salt; bring to a boil over medium-high heat. Cook for 4 minutes; stir in cornstarch/milk mix. Return to a boil and cook, stirring, until thickened, about 2 minutes. Place cream cheese in a bowl and pour in 1⁄4 cup hot milk mixture; whisk until smooth. Then whisk in remaining milk mixture. Pour mixture into a plastic bag; seal, and submerge in a bowl of ice water until chilled. Pour mixture into an ice cream maker; process according to manufacturer's instructions. Make the praline: Combine pecans, brown sugar, molasses, butter, cinnamon, and salt on a lined baking sheet (I used a silpat knock off from Amazon that worked great) and bake until bubbly and dark, about 12 minutes. Cool, roughly chop, and fold into churned ice cream. Transfer ice cream to a storage container (I love these Tovolo containers) and freeze until set. I waited two hours and it wasn't set up enough, but it was great after leaving it overnight. 4 hours may be enough as well if you can't stand to wait.